The cute and lovable native looking pair of Raj Tharun, Avika Gor of ‘Uyyala Jampala’ fame is back with this commercial flick movie ‘Cinema Chupistha Maava’ of Director Trinadh Rao Nakkina. Title is known to all. It’s a catchy phrase lifted from super hit ‘Race Gurram’ movie Cinema Chupistha Maava song. Let us see whether Cinema Chupistha Maava will show us the cinema or not ? Katthi (Raj Tharun) is Lazy and Aimless Guy,He fails in Intermediate exams,He fall in love with Parineetha (Avika Gor), Parineetha is academically very talented girl, Parineetha’s father (Rao Ramesh) was a Government Official,after lot of worrying Katthi manages to make her love him back with his attitude. Parineetha’s father(Rao Ramesh) comes into the picture and finds out about his daughter’s love affair, Rao Ramesh makes a challenge with Katthi, then rest of the story was how does Katthi manages to win his Love. With a hit pair Avika and Raj Tharun, first of all producer Bekkem Venugopal played a safe game with in his ambit. There are no where the signs of excessive production standards and struck firm to entertaining dialogue play. First half had low value on content. 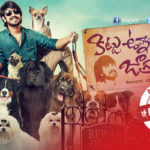 Raj Tharun made us glued at screen after Rao Ramesh began the narration from his point of view. College scenes are a boilerplate before heroine falls for hero. Again, Prasanna Kumar dialogues augmented the engagement factor. Interval is a regular garden variety Tollywood block. This completes first half on a satisfactory note providing the staging needed for second half to unveil. From here on, main lead character becomes heavy burdening on young and anemic looking Raj Tharun. Despite Rao Ramesh’s trustworthy presence tried to secure symmetry, low quality episodes spoofing ‘Kanchana’ damaged overall flow while Krishna Bhagawan’s presence is also comically wasted. Movie tends to dawdle forward with slackened scenes leading to a feeble climax. Posani is the key and he too cannot lift the play here. End titles roll on to connect the loose ends providing a logical salvation, it’s too late by then. Overall, Cinema Chupistha Maava can be a safe commercial venture for producers to attract a section of audience yet it’s an average film.